OSHA’s Hazard Communication Standard has been in place since 1994—it’s federal law (1910.1200). And so now the HCS is changing to reflect the GHS, and this means that the federal law is also changing and that businesses in the U.S. will have to make adjustments to chemical safety management plans to remain compliant. 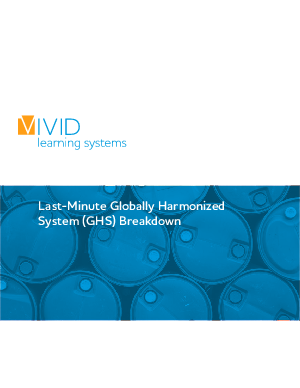 This ‘last minute GHS breakdown’ will bring you up to speed with this big change in federal chemical safety regulation by exploring how the GHS is being incorporated into the HCS, answer some of the biggest questions out there for private enterprise, and demonstrate how businesses will be directly impacted.